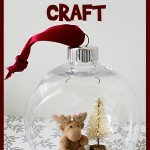 I love making Christmas ornaments! It’s a great way to personalize your tree. 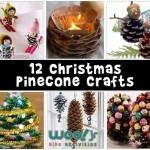 It’s also a great way to keep kids busy during holiday break while teaching them basic crafting skills. 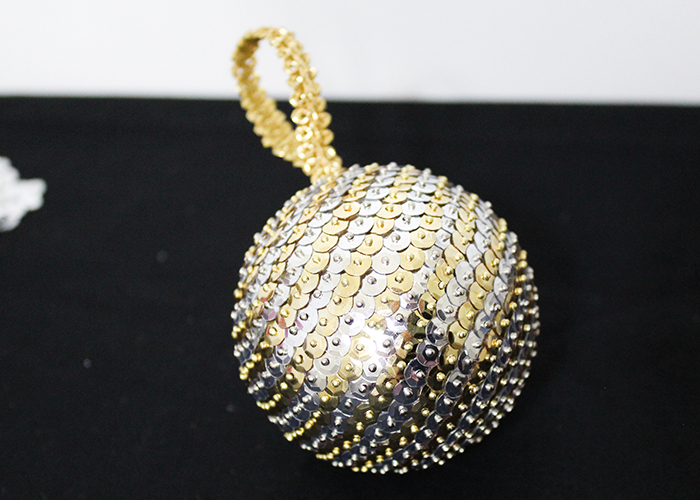 Today I’m going to show you how you can create this Sequin Christmas Ornament Craft. It’s very easy to make, but it does take a couple hours to put together so it’s great for a quiet evening project. Foam craft ball. I used a 2.5 inch one, but they come in all sizes. Sequins. I used 5mm ones, but larger ones look great too. 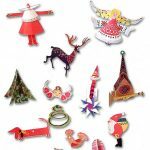 Sequin Pins. Length and color are up to you. Ribbon. 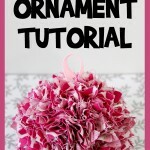 For creating the ornament loop. 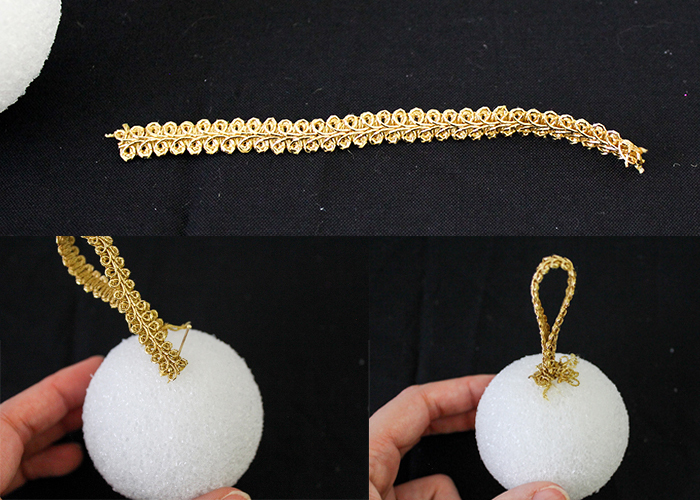 Start by cutting a length of your decorative ribbon to create the ornament loop! I just folded mine in half and pinned it into the foam, but for a stronger hold you can add a dab of hot glue. Next I suggest getting all your sequins and pins organized in a comfortable area for you to work. Start by figuring out your design. I decided to do diagonal stripes around the ball, but you can do nearly any pattern you could think up. 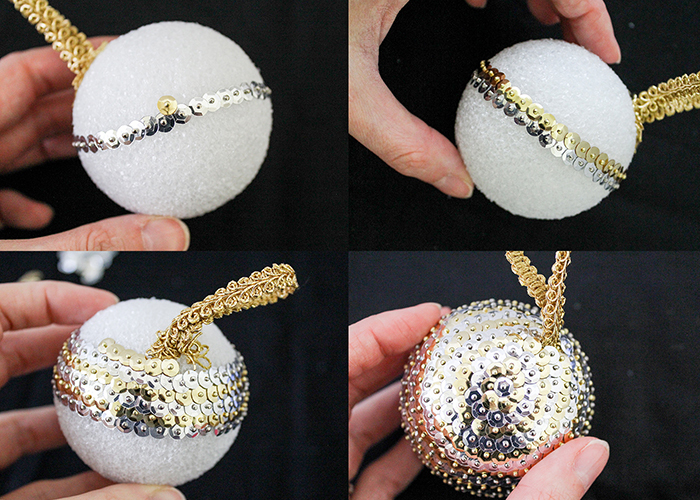 Just put your sequin where you want to begin, and put your pin down through it, straight into the ball. Start putting down the rest of your sequins for that section of the pattern, overlapping them slightly. Now we’re going to add our next row. You’ll want to offset the sequins so that no foam is showing. Place down your next row, or section, exactly like the first and slightly overlapping the first row. Then just keep going! 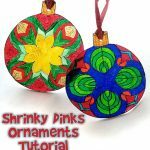 You might have to adjust your pattern as you go, because the ornaments are round and you’ll need slightly fewer sequins as you complete each row. When you get near the ribbon, you can put several sequins over the pinned down sections to cover them neatly. 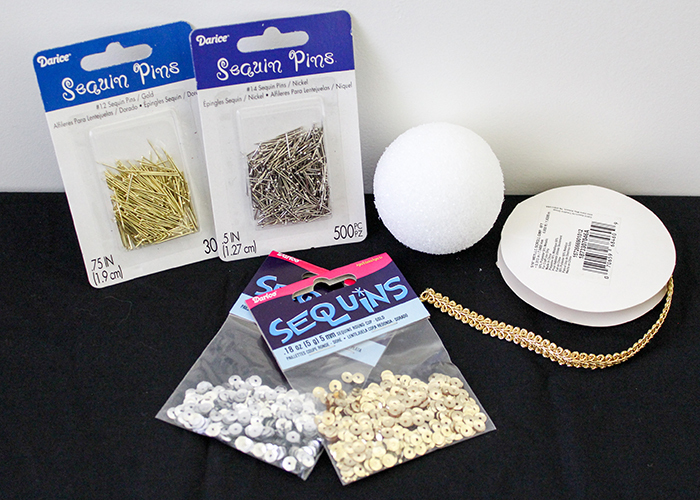 Remember, if you make a mistake it’s just pins and foam, so you can easily take sequins out and put them in the right spot. 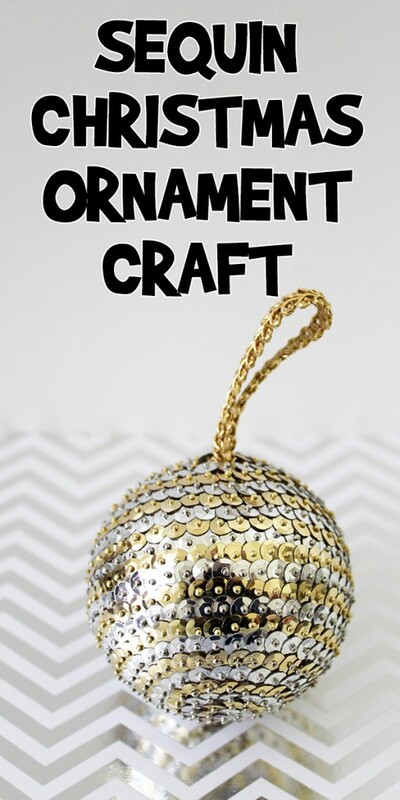 Have fun making sequined ornaments!! 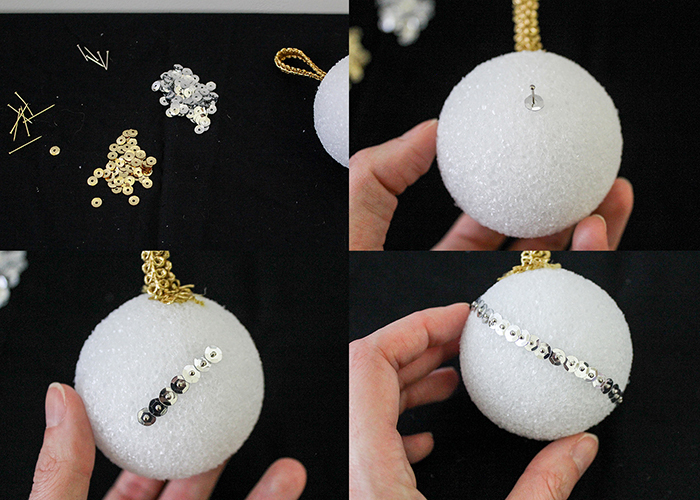 You can find sequins in all colors and styles, and make a bunch to match your holiday decorations! 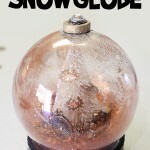 These also make amazing handmade gifts for family, and they’re easy enough for a 7 year old to make!